For weeks now, G.O.P. presidential candidate Mike Huckabee has been running a campaign that looks a great deal like a religious revival. Early references comparing himself to the Biblical underdog David were followed by campaign commercials in which the words "Christian Leader" flashed upon the screen. When his Christmas-themed commercial stirred up controversy, Huckabee used the opportunity to paint himself as the target of secularists. The approach has played well among conservative evangelicals, who are a crucial bloc in the Republican coalition. But it may be his undoing later. Recent history suggests that American voters have a guiding rule for contemporary religious politics  and they tend to punish candidates who break it. Huckabee is hardly the first to mix God and country. Over the years, Presidents and candidates for the White House have spoken of a higher power, prayed and been prayed for, sought divine favor for America, and expressed gratitude for providential outcomes. But something profound has changed in recent decades. In the years since Christian conservatives emerged from the cultural wilderness in the 1970s, presidential candidates have increasingly made religious faith a centerpiece of the U.S. political arena. From Ronald Reagan opening his 1980 presidential campaign by invoking John Winthrop's characterization of America as a chosen nation, a "shining city on a hill," to Bill Clinton's description of his 1992 Democratic convention acceptance speech as "the New Covenant"  a phrase drawn from the words of Jesus at the Last Supper  to George W. Bush's naming of Jesus as his favorite philosopher in a 1999 G.O.P. primary debate, public displays of faith are now de rigueur in U.S. presidential politics. But there are limits. Candidates can go too far and offend the millions of Americans who want Presidents to be comfortable with religion but not excessively zealous. (In a September 2007 Pew Research poll, 70% of voters said they wanted a President with strong religious beliefs, but 50% didn't like it when politicians talked about their faith.) It's a public posture rooted in the nation's founding, when pilgrims sought a place where they could practice their faith while also avoiding the religious strife that had plagued Europe for centuries. Even today, there is a golden rule for candidates running for the White House: display your religiosity, but don't be overly strident about it. In the 1992 election, President George H.W. Bush learned that breaking the golden rule could be politically fatal. When Republicans gathered in Houston for their national convention that year, Bush provided religious conservative favorites Pat Robertson and Pat Buchanan with prime slots in the speaking lineup and then allowed both to bypass the vetting process required for other speeches. That cleared the way for Buchanan to declare in his address: "There is a religious war going on in our country for the soul of America. It is a cultural war, as critical to the kind of nation we will one day be as was the Cold War itself." Many conservative evangelicals loved the bellicose rhetoric, but moderates were offended, and national news media responded with increased scrutiny of the campaign's religious politics. Bush immediately compounded matters by speaking to a national meeting of conservative religious leaders that included Robertson, Buchanan, Phyllis Schlafly, and Jerry Falwell. There Bush declared that the Democratic Party platform had "left out three simple letters, G-O-D"  a remark that prompted the New York Times to editorialize that Bush had "crossed a line" by "questioning the religious convictions of his opponents." Within weeks the frame was set among national journalists, and when conservative columnists joined in, the campaign was done. George Will, writing in late August 1992, said: "Serious people flinch from being associated with the intellectual slum that is the Bush campaign, with its riffraff of liars and aspiring ayatollahs." Something similar could happen in 2008 if the religious fervor of the G.O.P. primary season seeps over into the general election race. When Sam Brownback, a favorite of Christian conservatives, dropped out of the Republican race in late October, Huckabee immediately seized the opening at the Values Voters Summit organized by the Family Research Council. Unlike the 1992 G.O.P. 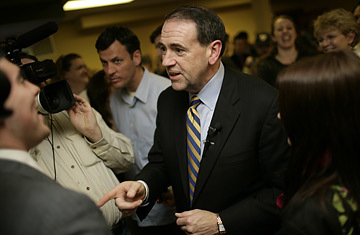 convention, when Bush and Buchanan were speaking to a national television audience, this gathering offered Huckabee a chance to deliver a narrowcast message. Such targeted contexts allow candidates to be more zealous in their religious politics than when speaking to the general public. But it only works when the national media aren't paying much attention. At that point in the campaign, Huckabee was considered a nonfactor, which gave him the freedom to sermonize in ways that his front-running opponents had to avoid. In his speech he invoked Old Testament prophets, referred to the "holocaust" of abortion, and declared "I think it's important that the language of Zion is a mother tongue, and not a recently acquired second language." A few media (including TIME) noted that Huckabee received more than half of the on-site votes in a straw poll, but most missed the story. By mid-November Huckabee was drawing wide support from conservatives in Iowa, where nearly 4 in 10 G.O.P. caucus-goers are evangelical Christians. Sensing the momentum, Huckabee put out an ad in which he said, "Faith doesn't just influence me; it really defines me" while the words "Christian Leader" appeared on the screen over footage of the candidate. Soon evangelicals in Iowa, and even nationally, began to move toward Huckabee. Such a take-no-prisoners religious politics may be pitch-perfect for the Republican primary, with its heavy tilt toward evangelicals. Eventually, however, Huckabee will have to appeal more broadly to moderates, either down the road in the primary or in a general election. This will be a challenge because, unlike any leading candidate in modern U.S. presidential history, Huckabee has a persona rooted in a history as an ordained minister. This part of Huckabee's narrative lends credibility to his religious politics. But it also puts many  including journalists now paying close attention  on high alert for potential religious stridency. And Huckabee, like Bush in 1992, has obliged. Asked in early December to explain his rise in the polls, Huckabee pointed to divine intervention: "There's only one explanation for it, and it's not a human one. It's the same power that helped a little boy with two fish and five loaves feed a crowd of 5,000 people." A few days later Huckabee, a Southern Baptist minister, asked a New York Times reporter whether opponent Mitt Romney's faith holds that Jesus and Satan are brothers. The question came off as calculated and narrowly religious, and the national press jumped on it. Huckabee had to apologize to Romney. For the Huckabee boom to have staying power, he has to realize that his campaign's narrowcast has become a broadcast. Among a now-vigilant national news media, Huckabee's every word, every reference, every campaign stop is going to be scrutinized for its religiosity. Any overstep will be trumpeted. Indeed, prominent conservatives Peggy Noonan and Charles Krauthammer  perhaps reprising the role that George Will played in 1992  each wrote opinion pieces in recent weeks decrying Huckabee's campaign as overly strident in its religiosity. For Huckabee, the test has become whether he can follow a political, instead of a religious, golden rule.